Lock & Key win major new master key system - 6,000 euro cylinders! Lock and Key chosen to supply Gatwick & Heathrow airports with specialist CEN 6 padlocks. Screwfix euro locks - not always the best value! ABS Key cutting £4.95 Vs £25 each !! Euro cylinders are used in the vast majority of double glazed doors, french doors and patio doors they are used to secure the door's multi point locking system. 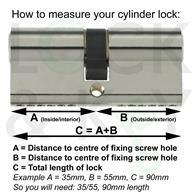 Cylinder door locks are not difficult to replace if you have basic DIY skills, you only need two measurements. 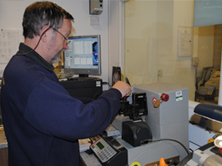 Established in 1975 the Lock and Key Centre have invested heavily in training and development of our team. 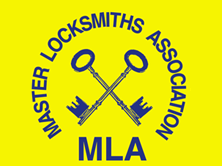 We are full members of the Master Locksmith Association (Our licence No 002515) and as such can offer genuine advice on the best solution for your security requirements. 5 Star Service - over 5,000 independent reviews! All our customers are asked for feedback by Trust Pilot, we are averaging 9.7/10 which is in the top 1% of the 90,000 companies registered with this service. No company is able to remove or edit any review left by a genuine customer. Every online customer is invited to review. Click the Trust Pilot logo to read our latest reviews. Since 1975 we have grown to be one of the UK's largest independent locksmith companies. Over the last 38 years we have gained a huge amount of technical and practical experience with nearly every type of security mechanism - from domestic door locks & commercial safe installations to hospital master key systems. We are now able to supply nationwide a huge range of security products, most with next day delivery options. Whenever possible we aim to offer prompt professional advice and guidance either on the phone, with our on-site 'how to guides' or email, to ensure you are happy with your door locks, padlocks, cylinder locks or any other security product we supply. We do try to work normal business hours - however if a customer is prepared to pay extra for a product or service to be delivered out of hours due to an emergency we are happy to quote a price when needed.